Back in February 2013, 200m2 built a special display housing to showcase ‘Princess’, the world’s first narrow gauge steam engine. Princess was returning to London for the first time in 150 years and went on display at London’s Paddington station to mark her 150th anniversary. For her return to London, the Ffestiniog railway commissioned 200m2 to design and build a temporary structure around Princess to showcase this marvel of 18th century engineering. 200m2 built a structure around Princess using its X- 20 TRUSSwire gantry system. High quality exhibition panel displays were then produced to hang from the structure to create a visual presence befitting a 150th birthday. The exhibition was so popular, the Ffestiniog railway were invited to return to London Paddington again this year. For the new display, F&WHR chose to display its new £250,000 luxury observation carriage, built to mark the 150th anniversary of passenger services on the Ffestiniog Railway. Sir Peter Hendy CBE, Commissioner of Transport for London visited Paddington Station to examine the new carriage. Sir Peter presented F&WHR General Manager Paul Lewin and Chairman Dr John Prideaux with a London Transport roundel and in exchange received a replica of one of the hand-carved wooden dragons that adorn the interior of the new carriage. 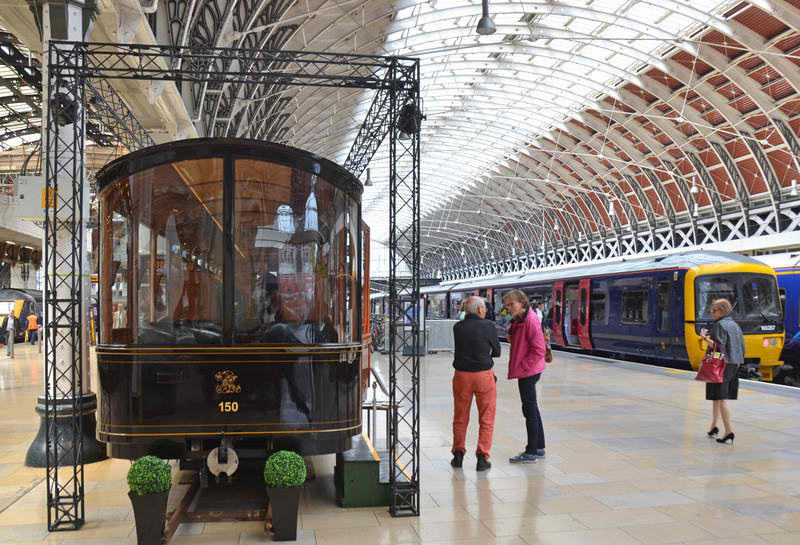 The carriage will be on display at London Paddington station on Platforms 8&9 until the end of June. To find out more about the display materials used to create this exhibition stand, call us on +44 20 3332 0092. Photos courtesy of Chris Parry.